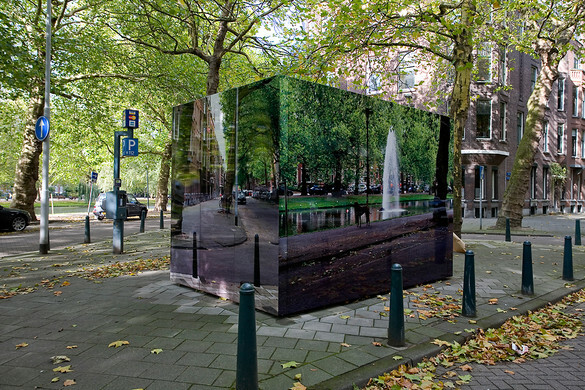 A Dutch artist has started making unsightly structures disappear though various optical techniques, creating a more beautiful–and way more interesting–looking city. Roeland Otten, a designer in Rotterdam, has come up with an ingenious way of hiding some of those ugly, functional buildings that litter city streets: Make them look like they’re not there. Taking a leaf out a survivalist’s handbook, he is painting, tiling, and wrapping small structures, so they are less visible to the naked eye–or at least, a little less of an eyesore. Otten got the idea when neighbors near where he lives in the old part of the city wanted to do something about a concrete electricity substation. They organized a competition for designers and artists, and Otten’s concept of plastering the building with hyper-high-res background pictures won. The actual design was realized by a local company that works on aluminum surfaces. Otten says the photos are holding up well four years later, and anti-graffiti paint means the frequent tagging is easy to wipe off. Following that project, he was asked by officials in Amsterdam to do something in a street there. The trouble was, the road is less pretty, so putting up an actual picture didn’t make sense. He decided on a pixelated effect instead–serving up a vague version of a Blokker household store behind. The hard-wearing French tiles cover an air-quality monitoring station. Back in Rotterdam, Otten was then commissioned to cover another substation. “It was not on a map, so when they redesigned the whole park, in the middle was an old electricity building from the 1970s that was not taken care of,” he says. “It was a last moment thing, and they asked me to come up with an idea.” The “dazzle camouflage” takes after an old technique for painting warships, and follows the lines of the buildings nearby. Should anyone else need some urban eye-trickery, Otten is available for further commissions. “I think it’s a solution for many ugly buildings in many different locations,” he says.